It’s always good to have a healthy, fall-back meal in the fridge, when you’re hungry and need something right now, or, when you just have to get back on track to eating healthy and nutritious. 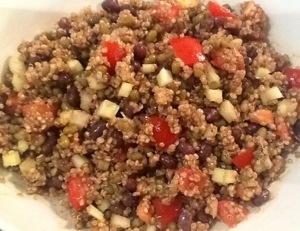 This Bean and Quinoa Pilaf is not only good for you and your soul, but super delicious!!! You can eat it hot, as a meal, side dish or simply……right out of the fridge, when you’re feeling a bit peckish! I like to make a lot so I can have it whenever I like. I call it Multi-talented because you can eat it plain, or dress it up with nuts and seeds, chopped fresh onion, etc. or add a few simple ingredients like fresh chopped tomatoes, cilantro etc. and a light dressing and viola! It turns into a great salad! A great alternative to rice! Try it and let it inspire you! There are a few ways to do this. You can cook everything separately and mix together, or if you’re like me and always look or the quickest and easiest way possible to get things done, try this ONE POT method. Worked great for me! Posted in GLUTEN FREE, LOW CARB, VEGAN, VEGITARIAN and tagged food, gluten free, Healthy Eating, low carb, recipes, Vegan, vegetarian. Bookmark the permalink. 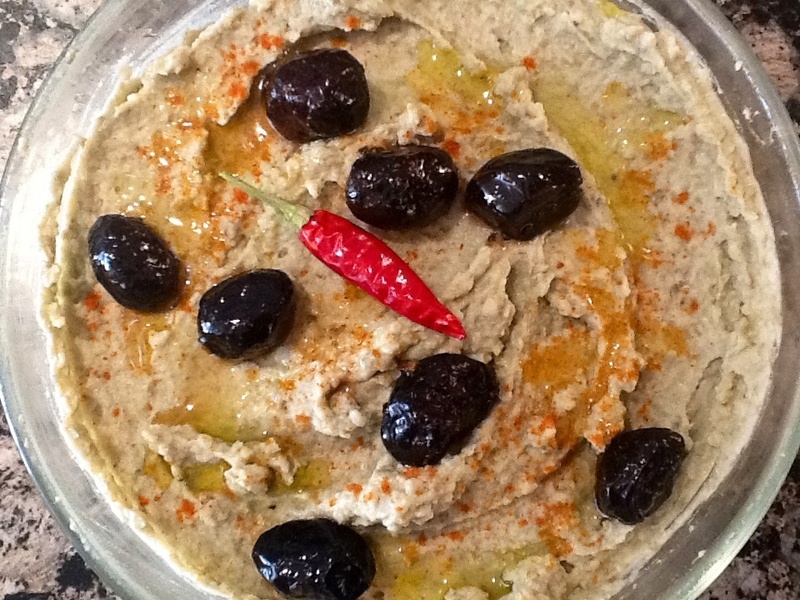 MUNG BEAN HUMMUS WITH A TWIST! 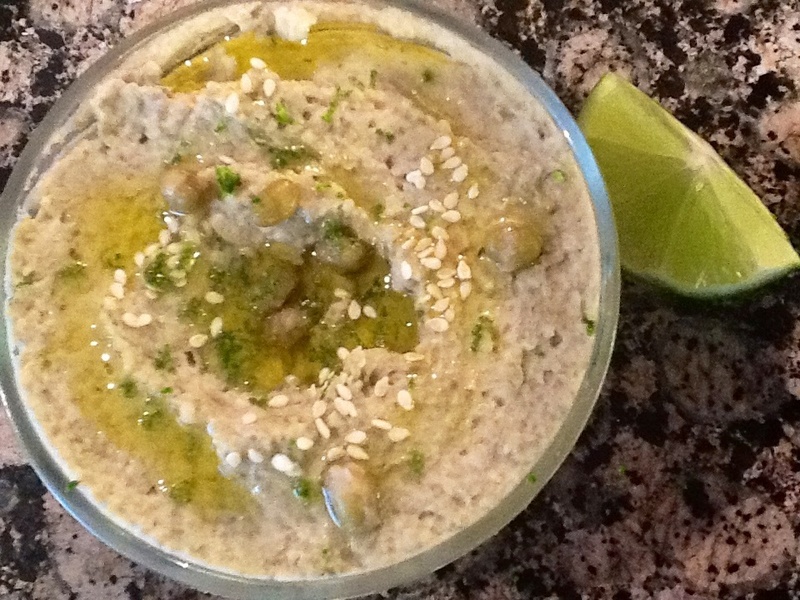 MUNG BEAN HUMMUS This is my take on Hummus, since I love the mighty Mung Bean! It’s a bit out of the box, but that’s a good thing if it tastes good, and that it does!!! 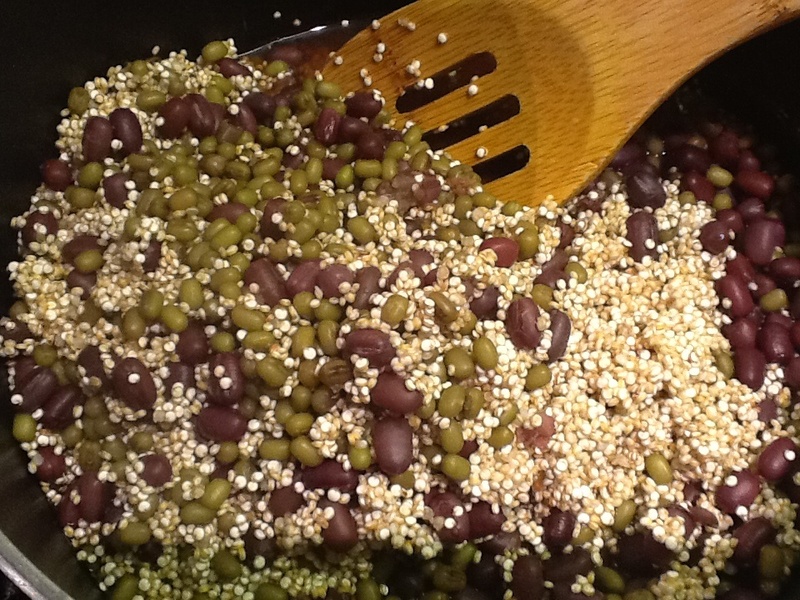 Mung Beans are super high in protein and fibre which reduces the carb value! 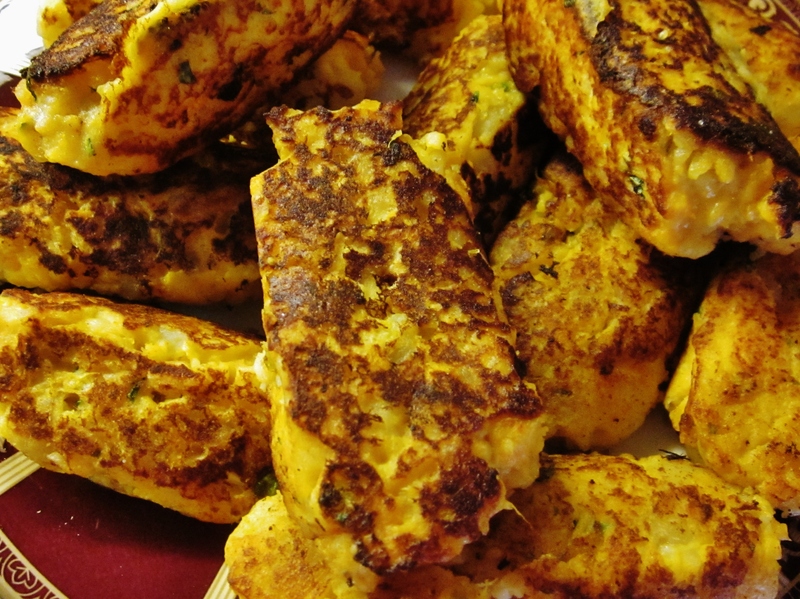 They are so versatile and delicious, that I continue to experiment with them. The raw Sesame Seeds adds a little crunch and the Lime Juice really compliments the combined flavours! Hope you like! 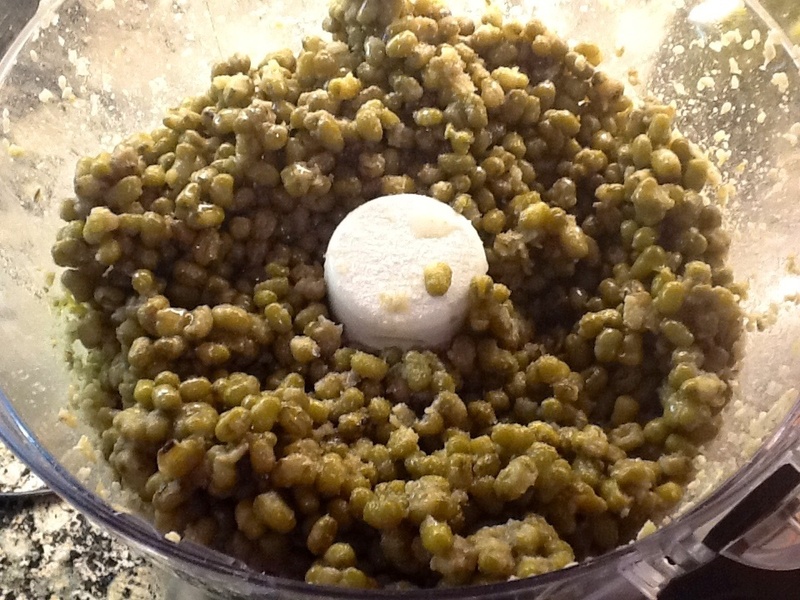 Rinse beans and cook in 2 cups of water for approx 40 min, till soft and let cool. 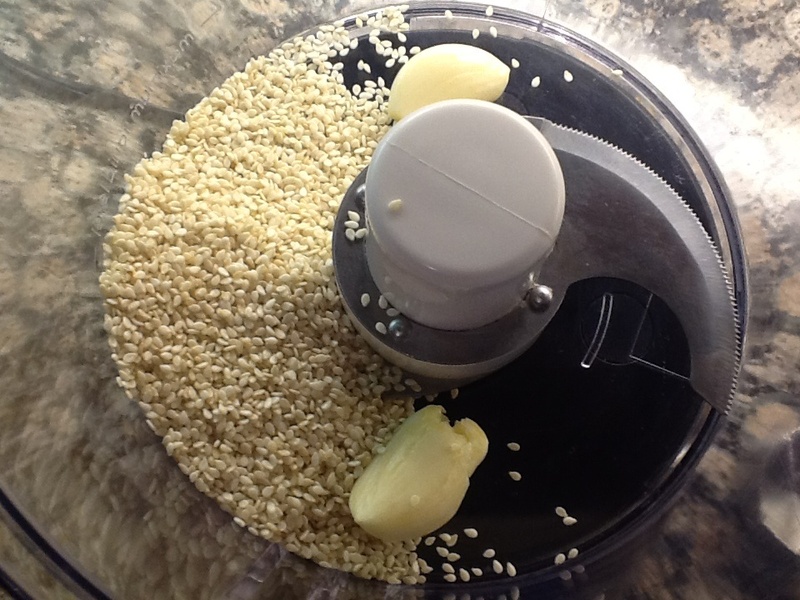 In a food processor add Garlic and Sesame Seeds and purée. 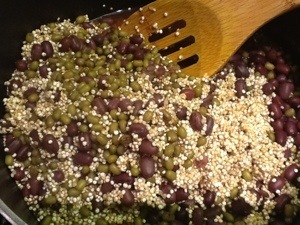 Add cooked and cooled Mung Beans, Olive Oil, Lime Juice and Sea Salt and process, stirring if necessary. Taste and refine flavours by adding more Olive Oil, Lime Juice and Salt. Add Cayenne to mixture or simply sprinkle on top. Posted in GLUTEN FREE, LOW CARB, VEGAN, VEGITARIAN and tagged food, gluten free, Healthy Eating, recipes, Vegan, vegetarian. Bookmark the permalink. The weather has been very weird lately. Just when you think the nice weather has arrived, we get blasted with more winter! At least it feels like it. I find the cold weather makes me want to cook and eat comfort food. 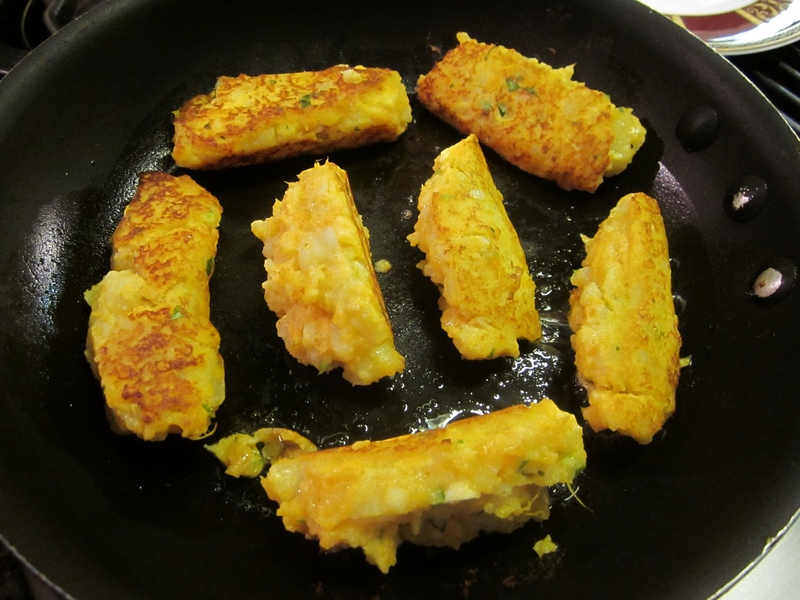 Today, I thought I’d try something my Mom used to make, that I loved, Croquettes. 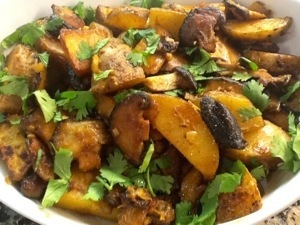 I love anything potato and although I don’t eat them too often, today was a potato day! 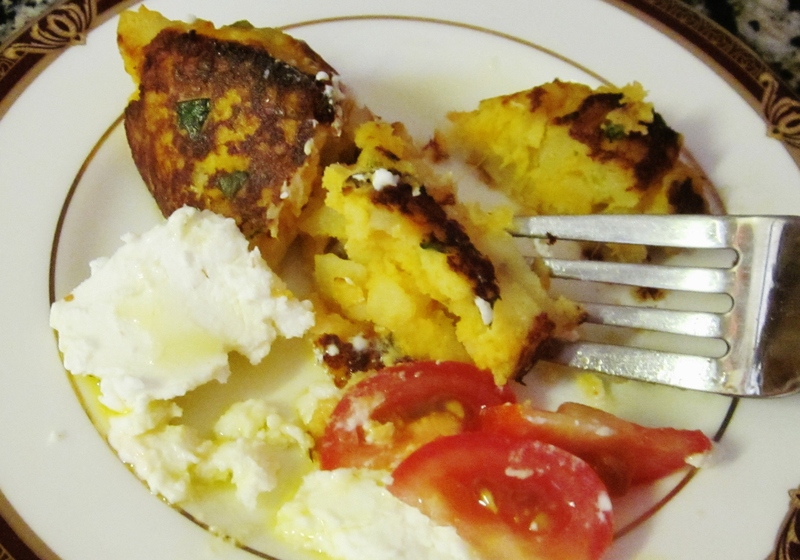 My Moms’ version was potato, (cooked of course), put through a ricer and then parsley, garlic, egg and Parmesan cheese was added. She hand formed them into fat looking cigars, then rolled them in flour and were pan-fried in olive oil till golden brown! I can still remember waiting patiently for her to put them on a plate so I could devour one, or two. They were so delicious and fluffy and almost fell apart if you didn’t handle them with respect! Well, I tried the ricer, which I borrowed from a friend, but that didn’t work out! I guess I’m not ricer savvy, Hehe. So I ditched it and used a fork. These are nowhere near the ones my Mother used to make, but they did turn out quite tasty! Boil potatoes and let cool. Peel and place in a bowl. 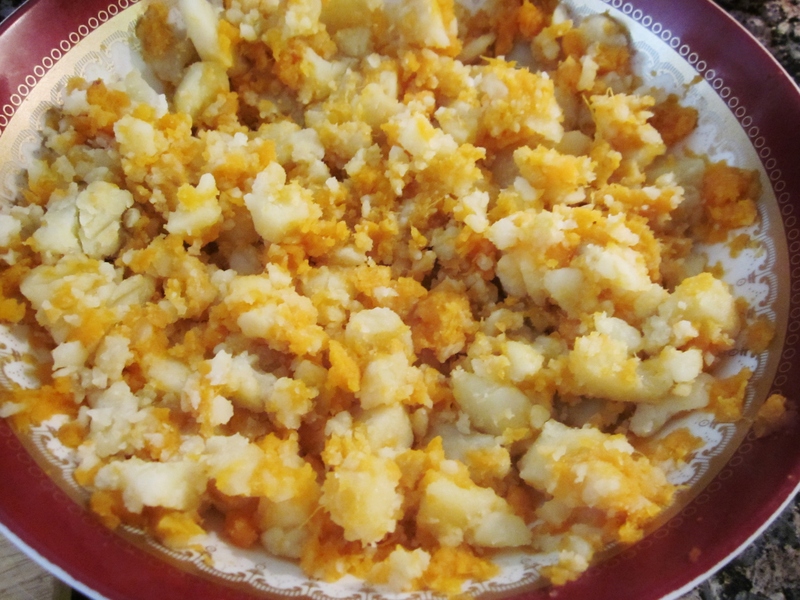 With a fork chop up the Potatoes and mash most of it, leaving some small chunks. 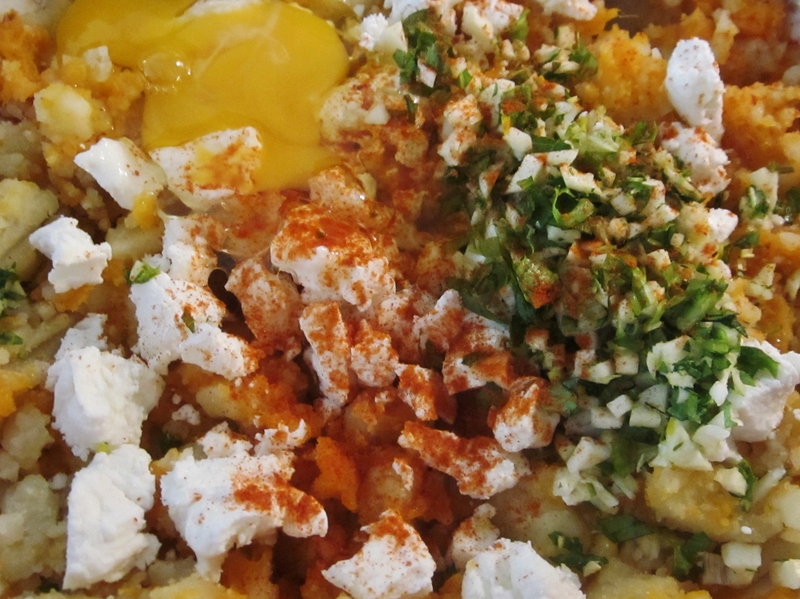 Add chopped Parsley, Garlic, Egg and crumbled Goat Cheese. Mix well and season with Salt and Cayenne. 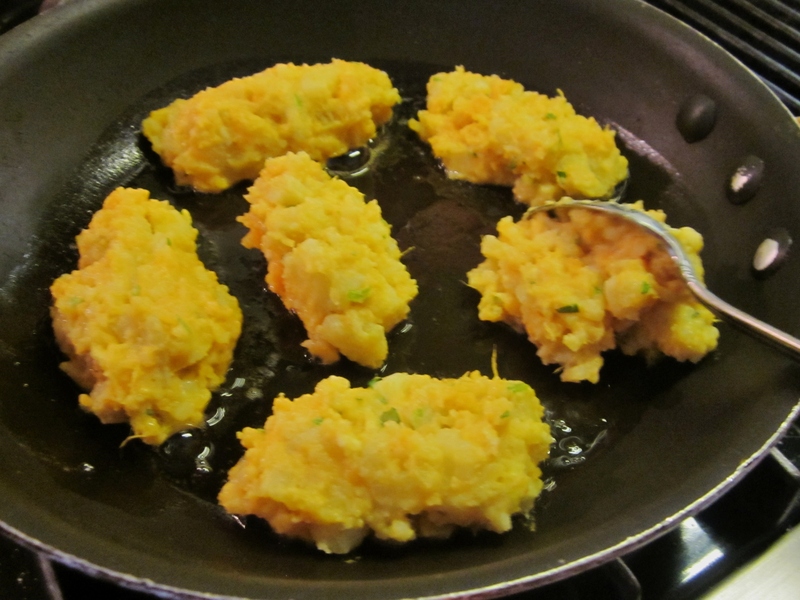 With a large spoon, scoop out mixture in a long shape and pan fry on med, with a little olive oil, till golden brown on all sides, (few min). Delicious, straight out of the pan, or room temperature! 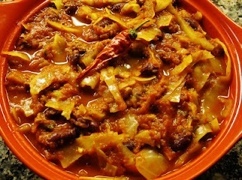 Posted in GLUTEN FREE, VEGITARIAN and tagged food, gluten free, healthy, recipes, vegetarian. Bookmark the permalink. This is part of the article, The Health Benefits of Mushroom Consumption, from my favourite Health Website Mercola.com about Mushrooms. I love mushrooms but never realized how good they were for you. I will definitely be eating more mushrooms! Mushrooms contain some of the most powerful natural medicines on the planet. About 100 species are being studied for their health-promoting benefits, and about a half-dozen really stand out for their ability to deliver a tremendous boost to your immune system. Nine recently presented studies on mushrooms detail a wide variety of health benefits, including: improved weight management, improved nutrition, increased vitamin D levels, and improved immune system function. One of the active medicinal compounds found in Cordyceps has been identified as a potential cancer drug. More recent studies suggest it also has potent anti-inflammatory characteristics that may be helpful for those suffering from: asthma, rheumatoid arthritis, renal failure, and stroke damage. It’s important to eat ONLY organically grown mushrooms because they absorb and concentrate whatever they grow in. Mushrooms are known to concentrate heavy metals, as well as air and water pollutants, so healthy growing conditions is a critical factor. Mushrooms that can help boost the nutrient content of your diet include: shiitake, reishi, cordyceps, turkey tail, and Himematsutake. 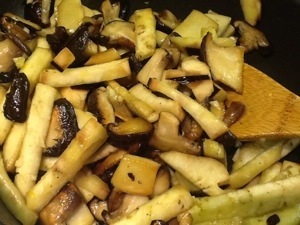 Chop up Mushrooms and sauté in a deep skillet on med until they start to sweat. 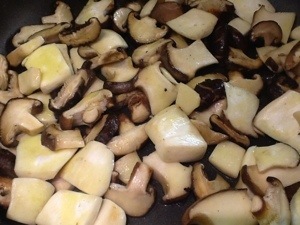 Lightly pour olive oil over the mushrooms, just enough to coat and continue to cook on med. 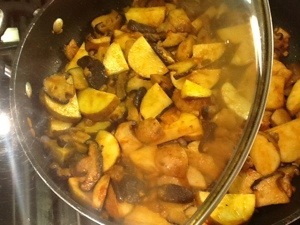 Add chopped garlic, eggplant, stir together and continue cooking for a few min till the eggplant becomes soft. 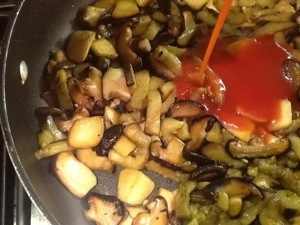 Add Tomato and seasoning to taste, stir well and cook until the tomato reduces and starts to caramelize. 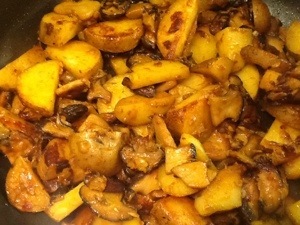 Add the potatoes stir together and cover. Continue to cook stirring every few minutes so the bottom doesn’t burn. It’s ready when you can easily pierce the potato. Sprinkle with chopped Cilantro and serve! If you don’t like Cilantro, you can use Parsley. 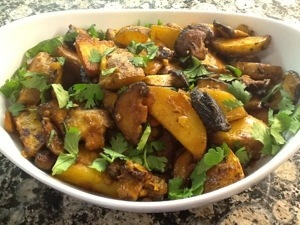 I like the Cilantro in this dish, but definitely adding some green, makes those taste buds pop! Posted in GLUTEN FREE, VEGITARIAN and tagged food, gluten free, healthy, recipes, Vegan, vegetarian. Bookmark the permalink. Remove from heat, stir and let cool, semi covered. Remove Cardamom pods. 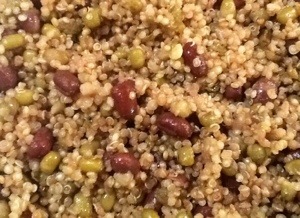 In a bowl, blend Quinoa with cooked Mung Beans. Add Spices to taste, Olive Oil and then Chopped Sauerkraut. Stir together and eat! Serve warm or room temp! Delish! Makes a delicious side or eat on its own. Posted in GLUTEN FREE, LOW CARB, VEGAN, VEGITARIAN and tagged food, high protein, recipes, Vegan, vegetarian. Bookmark the permalink. Everyone loves a good milkshake! If you’re dairy free, this is can be very difficult to achieve a palatable drink. I discovered this combination in one of my experimental modes. Looking to get everything I needed for, all around good nourishment and sustenance in a glass! I believe I have perfected it! The combination of Almond milk with coconut milk, I think, is really delicious! You can even add a little Pure Vanilla Extract as well. Yummy to drink all on its own! This drink is very filling because if its high protein and natural essential fatty content. 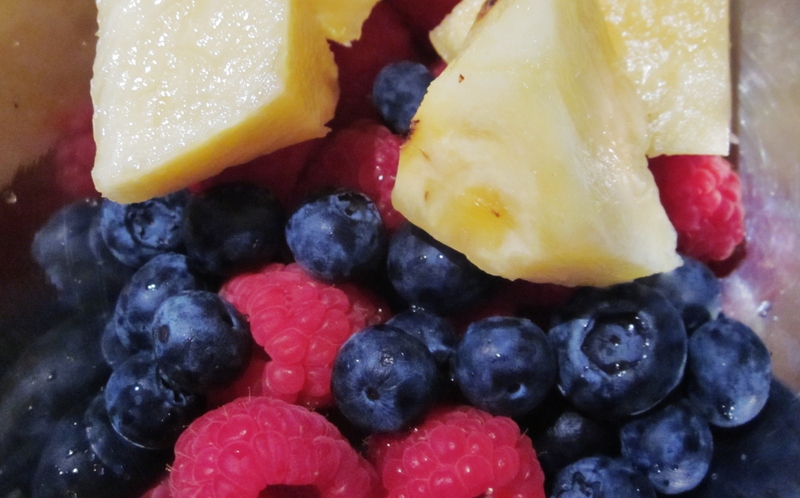 My favourite fruit combo is Blueberry, Pineapple. If you add Banana, you have to use a lot more liquid. Add the liquid to your Vita-Mix or high-speed blender and add nuts and seeds. Blend well! Add fruit, to taste and blend. Do not over blend! If it gets too thick add more liquid to desired thickness. Pour into a lovely glass and drink! *makes 3 1/2 cups or more depending on what you use! If you’re not sharing, pour excess into a glass right to the top, cover and refrigerate. Drink within 12-24 hours. Posted in GLUTEN FREE, LOW CARB, VEGAN, VEGITARIAN and tagged Blender Recipes, food, gluten free, healthy, Raw foods, recipes, Vegan, vegetarian. Bookmark the permalink.